For the latest gadgets of high quality, you have to go to the best retail outlets in the country to purchase them so that you can be guaranteed of what you have bought. The Nigerian mobile and digital retail space is ever increasing, hence the need for the best retail outlets. In this article, we present to you the top best mobile retail outlets in the country in no particular order. 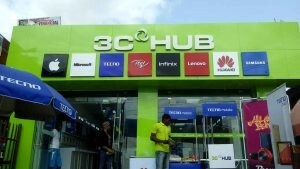 3C HUB is one of the fastest growing retail stores in the country that provides affordable goods of high quality. With 3C standing for Confident, Convenient and Comfortable, you can be rest assured that the products sold here are of high quality and their services and shopping environment is top notch. They sell all mobile phone types such as iPhone, Tecno, Infinix, Gionee, Samsung, Innjoo to mention but a few and they are one of the phone shops in Ikeja, Computer village. Slot Ltd is a trusted mobile retail outlet in Nigeria and a phone accessories shop in Ikeja, Computer village where you can get original Android phones, Tablets, computer accessories, batteries, I-phones etc at affordable prices. One thing about Slot phones and other devices they sell is that they are seen as original and are of high quality with warranty. Micro-Station operates online and offline (physical) stores. They are one of the foremost mobile and computer retail shops in the country. Their mission is to strategically position themselves to drive up the momentum for new discoveries with dedicated service and recognition to numerous customers. You can also find them selling original phones in computer village. They sell all mobile phone brands and their phones are one the most affordable you can get in the country. PTV Phones is a fast rising retail shop in Nigeria that deals in mobile phones and accessories. They have an online platform too where people can directly place an order for products they want to buy. Yudala is an online and offline mobile retail store. Yudala is the first online mobile retail store in the country and it has mega retail stores across the country. Their logistics system is excellent and they help customers track their delivery process until it reaches them. Pointek is one of Nigerian’s leading Online and Retail Store that is well known for quality cell Phones, Smartphones, Tablets, and Accessories for your Smartphones, Computers, and Air-conditioners, Televisions etc. The offline retail outlet is fast emerging in Nigeria. Affordable phones is a mobile retail shop that deals in all kinds of mobile phones at an affordable prices. They are an upcoming brand in Nigeria and they have shops in Ikeja and Ikorodu area of Lagos State. Mizbeach is a popular brand in Computer village and has been spreading its tentacles to other parts of the country. They are known for their wholesale service to phone resellers at affordable prices. Their head office is located at Agege, Lagos and they have warranty service on their products. Revive Technologies Limited is retail outlet which is known for its mobile phones servicing in the past but now has grown to be of the ten mobile phones retail outlets in Nigeria. They deal in all kinds of mobile phone devices and they are located in Lagos and other big Cities in Nigeria. Parktel International is a mobile phone company specialized in the distribution of mobile phones and mobile devices of different brands and models in Nigeria and within the West African coast of the continent. The company sells all major brands like Samsung, Tecno, Infinix, Nokia, LG, Sony Erickson etc. in Nigeria.